« Be Not Afraid… A new expansion for Small World coming this Fall! 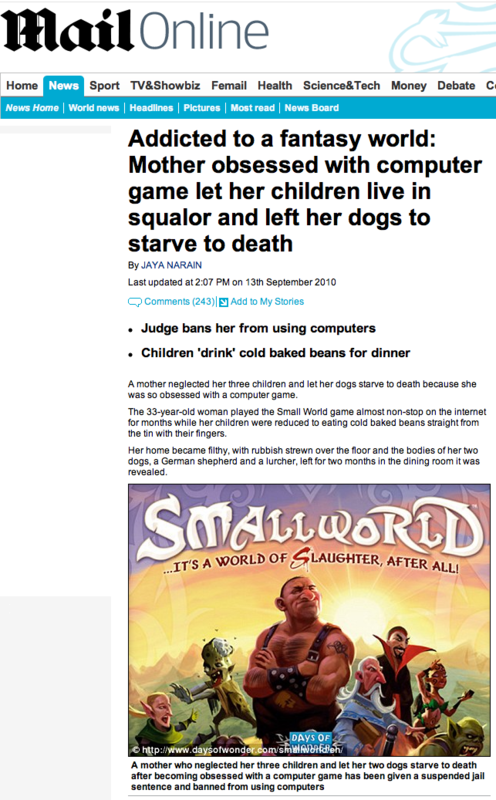 Small World not responsible for killing dogs or neglecting children. In a classic case of “Google Journalism”, erroneous press reports from British newspapers, the Daily Mail and the Sun that implicate Days of Wonder’s Small World board game have spread like wildfire over the internet. The stories mistakenly blame the Small World board game as the reason a British woman neglected her children and let the family dogs die because she was so addicted to online game play. We can only assume that the so-called “journalists” mistook Small World, for a similarly named online virtual world. While unable to spend a few minutes fact-checking to learn that their story could not be possibly true (Small World has no online play – the only digital version is the two player Small World for iPad); they were able to search our website to download graphics of the board game and further smear our name. Days of Wonder categorically states that the Small World board game is not in any way connected to this tragic story and we are asking the papers in question retract their stories. Full details and a statement from Days of Wonder CEO, Eric Hautemont are available in this press release. We have invited these journalists to check their facts a little more closely next time by visiting the Small World board game web page or the Small World for iPad section of the App Store. This entry was posted on Monday, September 13th, 2010 at 23:07 and is filed under Blogroll, Days of Wonder Online, Miscellaneous, News, Small World. You can follow any responses to this entry through the RSS 2.0 feed. Both comments and pings are currently closed. If you could make this a lawsuit, I would. As a gamer and a citizen of the UK; I am ashamed to be part of this country. It is lazy, half-assed journalism that has messed up the gaming industry; time and time again. They couldn’t even check a simple fact, which has now given society an even more prejudiced view of gamers. If I was you, I’d sue them for everything they have. This is just not acceptable, so they should be made to pay for the damages to your company and reputation. Don’t be ashamed Azhdeen…having worked in news for a few years, I have seen how stupid and lazy our journalists are too. Unfortunately, as always, the retraction will be printed in a small, easy-to-miss spot. Fortunately the reader is left in no doubt that the story here is the neglect, not the computer game. DoW is not painted in a bad image, so I’d see it as free publicity. This doesn’t detract from the fact that it’s still shoddy journalism, but we expect no different from the Mail. Eric… when you publish and EXCELLENT GAME and when your name comes FIRST in a Google search about – frankly – any remotely related keyword … then I guess it’s the price to pay for fame and success! lucky for Jaya Narain that he (she?) was far from the Berserk Ghouls and Flying Sorcerers wrath today …. I actually thought this was a joke at first. How can this be allowed? Shouldn’t you be able to take them to court for defamation and at least get a retraction? That’s horrible!! If you were lucky, you might get them forced to print it on the front cover. You’d be AMAZED how tiny they can print things. Some cover retractions are so small you wouldn’t even realise there was text there unless you were looking – they stuff them right into the corner of a coloured block, or something along those lines. Last time I checked, you guys own a registered trademark for Small World in the computer game category. Trademark law requires you to protect and defend your mark. If you go to Google News and search the words ‘small world mother’, you’ll see 60 articles that that are directly related to this story. I only found one that referred to the mix-up. There are a lot of angry comments (angry towards both the mother and, believe it or not, the “publisher of Small World”). It’s too late for retractions, since most people just read articles and go on their way. The damage has been done! It is no joke, and we are taking the appropriate steps on all fronts. Thank you for your concerns. Looks like it most likely http://www.smallworlds.com/login.php?login=true that she was playing. It has both a facebook presence and looks to be massively multiplayer with potentially addicting game play. That’s our Daily Mail; lazy, venal, sensationalist, arrogant, and pandering to every middle-class hysteria going. I think they just see paying damages as part of their operating costs. Too bad it wasn’t the Sun and West End Games, then I’d went for “Stick it up your Junta”. Sue! And don’t just them get away with a retraction. As others have noted the damage has already been done and a retraction will not help repair your reputation. Take the lazy gits to the cleaners. Done. We’ll also install shortly a tool that will kill those once and for all. Complain to the Press Complaints Commission! Well you could, but their Code of Practice Committee is chaired by one Paul Dacre, who also edits the Daily Mail. I’m not a particularly big gamer, but the kind of tripe the Mail and the Sun regularly publish under the guise of ‘journalism’ is absolutely appaling, I sincerely hope you take this to court and help put a stop to their rabble-rousing, lowest common denominator rubbish. I honestly hope that no one reading this ‘newspaper’ is foolish enough to take the obviously skewed story seriously. Absolutely disgusting and indefensible. Matt, I think we both know stopping the “lowest common denominator rubbish” will never happen as long as so many people consume it. Also, we both know that too many people will take this story too seriously. I know. It makes me sad too. It’s interesting to read the comments that don’t look at the wider picture of how much neglect and abuse the children suffered before the mother became addicted to the online game. Neglect of this level doesn’t simply start without a long history within that specific family unit and in the extended family. You raise your children in way similar to the way you were raised. Neglect doesn’t start suddenly because of a computer game. There were obviously long term issues within this family, but of course that is not as sensationalist as “mother addicted to computer games starves dogs and children” headlines. But then again the days of quality, well researched journalism went away during the 1980’s and have never been seen since. With a society obsessed with celebrity, reality tv and sensationalist ‘journalism’ we are never going to get a full accurate picture of what actually happens in these disfunctional, neglectful and abusive families. That would need understanding, compassion and time. All far too expensive for our profit obsessed media. Also Sam, these days it’s nobody’s fault. Everyone is looking for someone to blame: music, television, video games, etc. Sue them. Make it too expensive NOT to check their facts. Sue for loss of income. DOW, please seriously consider suing Daily Mail. After taking them to court, try and make the story of the game company suing the newspaper appear in a legitimate paper or other news media. If you don’t sue, at least try to get a legitimate paper to report the mess up & possibility of legal action. From my limited experience working in news, I have found that news directors love burning other news organizations, especially their competition. This. Time for a press release! Nice PR story, by the way. If you consider the abuse that Dungeons & Dragons took in the 1980s and 1990s — accusations that it produced obsessed, satanic teen players — I don’t think this will end up being much of a problem. Yes, it was sloppy journalism. But readers will vent now and forget tomorrow. And by next week, they’ll be talking about that mom who starved her kids while playing Dungeons & Dragons. It’s a terrible story, and awful to see a responsible publisher getting falsely accused. But I loved your official reply, Eric! It shows that you haven’t lost your sense of humor – even when facing strong – and false – accusations! Hopefully will the story attract more sales than it will scare away! Hopefully after all this attention you can get your games into Walmart! I see more of those darn “spam” site links are showing up here. But in regards to the article, I do hope you folks pursue them via whatever manner possible. Just because it is a game doesn’t let them run wild with accusations like this, even if Small World does appear first in the google listings. And hopefully more than a little itty bitty item like in the 2nd or 3rd page for a retraction as well!! Yes, we keep fighting them manually, but in one or two days, we’ll have a definitive solution. This is a side-effect of the high traffic of this news, it attracts spammers too. The same story was written here in Belgium (online, quality newspaper). They also used a pic of Smallworld. But today, they’ve changed the pic and the story (DOW isn’t mentioned anymore). I’ve just seen this on a Spanish TV channel’s news, and they used the boardgame facebook page, as well as images and videos of the actual board game, pieces and all. Thought you should know. Do you know which TV channel, and at what time they aired this? Please sue the Daily Mail for defamation. The law of Libel is a mechanism for billionaires to silence criticism of their actions using the resources of the English judicial system. That’s it. All of it. There is nothing in it about justice, truth, or protecting the innocent or the powerless. Days of Wonder would need to be a thousand times larger to even consider the expense of bringing a case to court; and even then, the risk of losing would lead to their collapse as surely as incurring the costs of an actual loss… And for what? The papers involve write off tens of millions in libel payments – mostly settled – every year or so: lying for profit is their business and their risk management is flawless. If Days of Wonder *were* a thousand times larger, their advertising ‘spend’ in the print media would, of course, have placed them above all criticism. Having played Smallworld (by DoW) and enjoyed it, reading through the small worlds thread on this story is kinda sad. Essentially “It’s not our game! This couldn’t happen to us!” Not-in-my-backyard sort of stuff. Bunch of sycophantic players sucking up to a dev. Clearly, Days of Wonder did not produce the game this woman was obsessed with, and it’s terrible that the imagery damns the company’s image. Addiction of any sort is awful, but that the media sensationalizes without fact checking is a real crummy deal for the innocent. Well, we’ll find out how big the impact gets if it shows up on Fox News. Not sure about British law, but in the States you probably couldn’t sue for libel, defamation, etc. It’s not meant to cover honest screw-ups. Thankfully, the laws in Britain and related common law countries protect those who have suffered the damage a lot more that the US. That said, there is never any guarantee with litigation is there. As a practicing lawyer with knowledge of the area I can’t help but itch to get my claws in to the Daily Mail! Eric, I wish you the best of luck with whatever legal counsel you have. Probable source of the screw-up? The article said that she was playing “Small World” on the “internet”. She *could* have been playing the board game over internet chat, describing the moves remotely to a friend with their own copy of the board game. That would also explain why it was taking her sooooo long to finish the game. It took me literally 50 seconds of research to find that the Board Game Small World is not available on facebook. I had fancied playing it as my first game of the actual board game was fun, if very disappointing, I came second to last. Imagine my chagrin to find that Facebook’s small worlds, looks just like the sims games. When will FB get a decent multiplayer game unlike the formulaic mafia ones with different skins ? You could try an out of court settlement and a few articles promoting your games. I assume that if you get a retraction from them printed on page 27 in size 8 font, there is nothing stopping you from reprinting this on your website on the front page (or on it’s own page), fully Search Engine Optimised with keywords such as Libel, Defamation, The Sun, Daily Mail, Retraction, Misquoting etc so that every search engine will pick it up? They may not want to shout about their retraction, but you can (And we can follow up by re-twittering it and posting it on Facebook)! !